Postural assessmentThis is a 4-hour process whereby a variety of tools are used to measure range-of-motion, a visual examination, and the use of a camera to record various body positions.Programme DesignThe information collected helps Scott create a programme specifically tailored to each individual client. 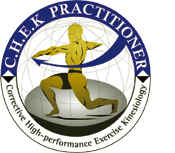 The methods used by Corrective Exercise Specialists are scientifically proven, safe and effective. Each session is based on each individual’s uniquely designed programme, are 45 minutes long and consists of stretching, warm-up, workout and cool down. Then 15 mins of feedback. This book reveals the techniques and secrets previously available only to the select clients and students of Paul Chek. In “How to Eat, Move and Be Healthy!” Chek shares his approach to achieving a healthy, balanced lifestyle while also dropping pounds and re-shaping your body. Each person is unique! The way we respond to food, exercise and stress vary from person-to-person just as much as our fingerprints. This book will identify the reader’s individual needs and teach them to address issues that may be preventing them from looking and feeling their best. Paul discusses research, uncovers controversies and provides practical suggestions for achieving peak vitality.